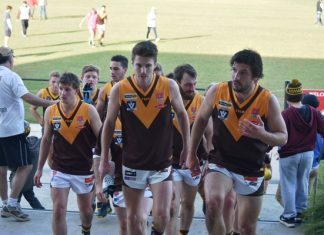 An inspired Drysdale upstaged Bellarine rivals Ocean Grove by 60 points at Ray Menzies Memorial Oval on Saturday 1 July. It was the Hawks fourth win of 2017 and they remain in eighth spot after 13 rounds. Final scores Drysdale 20.13(133) to Ocean Grove 10.13(73). Drysdale coach Wade Chapman said the convincing 10-goal victory was the most complete performance this season. “I like the even contribution (we had) and everyone played their role,” Chapman told the Voice. “We are a hard working side. Hawk forward Matthew Hebbard was brilliant and snared eight goals. Hebbard – recruited from St Mary’s – has kicked 21 goals from 10 senior games in 2017. “It was his best game,“ Chapman said. Drysdale player Sam Edwards booted four goals, while Jake Kiddle booted two majors. Hawk Kyle Davis, the 2016 Bellarine Football League Rookie of the year, was a standout. The Hawks got off to a flyer thanks to veteran Adrian Robinson who kicked two goals, he roamed packs and set up numerous plays inside 50. The visitors led by four goals at quarter time after they kicked six goals in the first term. Key tall Damien Hoare dominated in absence of injured Ocean Grove ruckman Andrew Jarvis. Hoare left ground mid-way through game with a finger injury and took some crucial towering marks upon his return. Chapman said the focus is on improvement for remainder of 2017 and claim another BFL finals scalp like Ocean Grove. “We look forward to having a break and then coming back and taking on the Ammos,” he said. 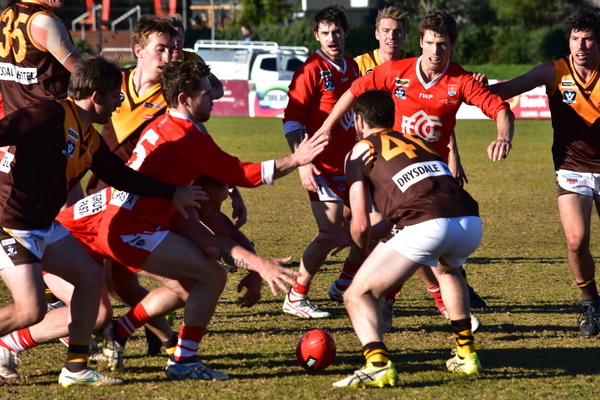 In the reserves clash, Drysdale claimed a 33-point win over Ocean Grove. Hawk forward Simon Scott booted three goals, while team-mates Josh Walsh and Daniel Kerr each kicked two majors.